Ceramic roses and hand forged leaves ornaments make this 5 lights flush mount a one-of-a-kind treasury for your home. This gorgeous wrought iron sconce is an example of the high artisanal craftmanship of the Florentine art here in Italy. I am cooperating with many artisans who provide me with their beauties which I decorate and enrich with crystals, special coating and antique look effects, too. 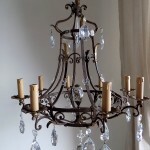 This one-of-a-kind authentic antique wrought iron chandelier with 8 lights, coming from the South of France and dating approx end of 800s, is especially suitable for rustic chic home. Pair of empire style French sconces with one light, repurposed in shabby chic style, ivory color and enriched with Aurora Borealis glass crystals and drops.Price is indended for the pair of scoces. Selected 1 as quantity you'll get two sconces.